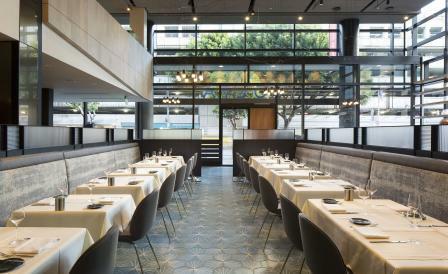 The culinary awakening of San Francisco’s Yerba Buena Cultural District continues with the recent opening of Volta, the third restaurant from co-owners Umberto Gibin and Staffan Terje who also helm city favourites, Perbacco and Barbacco. The name — Latin for a change in direction — marks a departure from the Italian cuisine for which the duo are known, as here, Swedish-born executive chef Terje turns the focus to French brasserie cuisine that leans heavily on Scandinavian culinary traditions. The theme continues at the cast concrete bar, a destination in itself, where French wines sit side-by-side with house-made aquavits from Terje, which also find their way into cocktails such as the eponymously named Volta, containing carrot juice, honey syrup and lemon. It’s all housed in a glass box designed by CCS Architecture, no stranger to Gibin and Terje, having worked on their other two restaurants. At Volta, a clean, bright aesthetic has been applied by way of cast concrete walls, buttressed by street-facing glass walls that flood the space with natural light. The two-storey space is dramatic — thanks to mezzanine level dining — and elegant, flanked by a series of luxe materials including French oak, blackened steel and bronze mirror, while hexagonal concrete tiles that run wall to wall provide a sense of consistency throughout the 8,00sq ft restaurant. Geometric hanging pendant lights that are both delicate and striking loom large over banquettes and booths divided by patterned glass, and give diners just one more reason to linger.